Going forward, as weak nations in the Eurozone ask for help, they cede sovereign control over their budgets. In return, the ECB is ready to deploy its (unlimited) resources to lower their respective costs of borrowing. Crucial in this context is that politicians in the Eurozone, not the ECB, approve the help. Also crucial is that the ECB 'conditionality' merely requires, as ECB President Draghi puts it "broad lines, leaving it up to the governments themselves what the precise shape is." Many rightfully point out that this may simply help weak countries to 'kick the can down the road', or even to hold stronger countries hostage: think Spain that thinks it has done enough and will 'demand' help without engaging in further structural reform. No kidding. And indeed, the silver lining of the high cost of borrowing has been that major structural reform was pursued because of the "encouragement" of the bond market. But what does it mean for the euro? When it comes to the U.S. dollar, British pound, Japanese yen, the respective central bank's policies guide the short-term borrowing costs for their governments. In the Eurozone, there's "fragmentation" as weaker countries have a substantially higher cost of borrowing than stronger ones; in ECB President Draghi's words, the "monetary transmission mechanism" is broken. The new policy addresses that by providing a mechanism to have such rates converge. But he is not only imposing a rate convergence, he is also imposing a political convergence given the requirement that governments give up sovereign control over their budgets. What one ends up with is what one would expect from a central bank: borrowing costs more in line with what the central banks like to see. Draghi correctly points out that the new framework will only be effective if supported by sustainable fiscal policy. But he also points out that this is a challenge no different from the challenge of any other central bank. There's only so much that monetary policy can do; central banks cannot solve fiscal problems. We can only hope that the Federal Reserve has tuned in and heeds that advice. Fiscal issues must keep politicians busy - that's what they are elected to do. We may not be satisfied with the state of fiscal affairs in the Eurozone, but are we satisfied with the state of fiscal affairs in the U.S.? In the U.K.? In Japan? The Eurozone is growing up, but that doesn't mean fiscal challenges will evaporate. The European Central Bank, in its own words, has created an "effective backstop to remove tail risk from the euro area." That is correct and justifies the rally we have seen in the euro in recent weeks in anticipation of today's announcement. Money has been flowing from pricey currencies that benefited from the "everything but the euro" trade, including the U.S. dollar, to the euro. As this new framework settles in, we expect to see further euro appreciation. Thereafter, we can look at the euro like any other currency with all the good and bad that comes with it. We don't expect a disengagement of the rather activist approach by policy makers. As such, the currency market will, in our assessment, remain a formidable place where the 'mania of policy makers' will be reflected. Such activism is not good for capital allocation, but that's a global, not a Eurozone challenge. While the U.S. is busy contemplating QEn+1, the Eurozone will provide stimulus by lowering the borrowing cost of peripheral Eurozone countries. 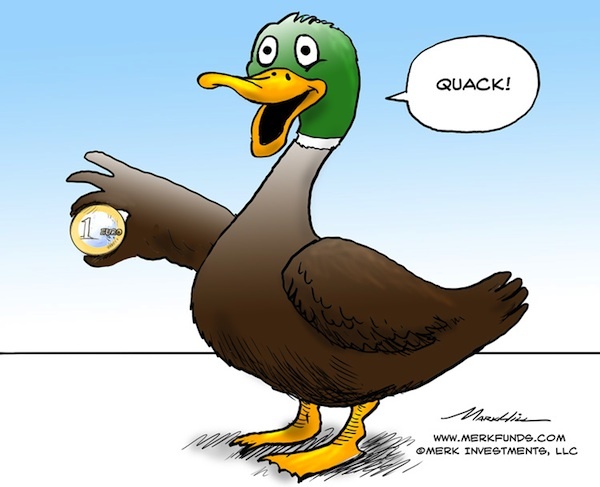 If the promised sterilization of the ECB's Outright Monetary Transactions (OMT), as the new program is called, is implemented effectively, the U.S. Dollar might get a mighty competitor, even as we continue to be confronted with politicians the world over ducking the tough choices.